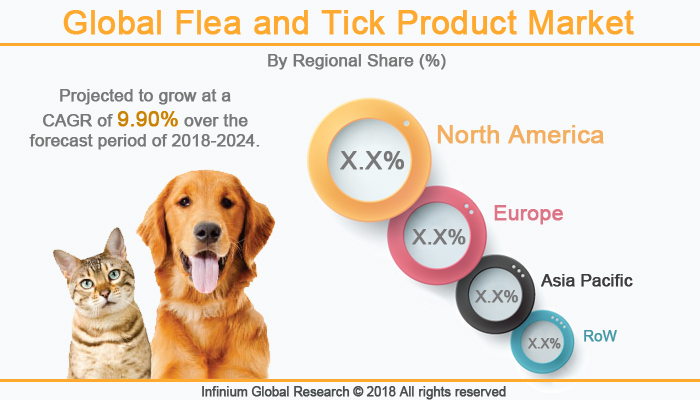 A recent report published by Infinium Global Research on flea and tick product market provides in-depth analysis of segments and sub-segments in global as well as regional flea and tick product market. The study also highlights the impact of drivers, restraints and macro indicators on the global and regional flea and tick product market over the short term as well as long term. The report is a comprehensive presentation of trends, forecast and dollar values of global flea and tick product market. According to the report, the global flea and tick product market is projected to grow at a CAGR of 9.90% over the forecast period of 2018-2024. Flea and tick products are pesticides or repellents that are used to treat or avoid flea and tick infection in animals such as dogs and cats. Flea and ticks are parasites that cause uneasiness and illness in pets. Fleas cause allergic reaction and itching that results in anemia in animals. Infections such as Lyme disease can be transmitted through ticks. Tick bites are irritating and painful and the diseases they transmit are anaplasmosis, babesiosis ehrlichiosis and so on. Flea and tick prevention is one of the best ways to keep the pets well. Growing consciousness for pet care to protect pets from the parasite attacks and itching caused due to fleas and ticks has resulted in the rising demand for flea and tick products. Consumers are demanding these products in order to keep their pets healthy. Moreover, product accessibility through different channels and changing consumer approach toward pets are also some of the main factors boosting the demand for flea and tick products. Hence, repetitive habits and consciousness of consumers depending on these pet products are predicted to drive the demand for flea and tick products in the upcoming year. On the other side, growing concern for the side effects of the flea and tick products such as loss of hair, rashes, vomiting and so on hampers the growth of the flea and tick products market. In terms of geographies, North America is the largest growing region in the global flea and tick product market followed by Europe. The Asia Pacific is the fastest growing region in flea and tick products market. In North America region factors such as rising number of pet owners, and the growing concerns of pet owners towards the proper health of the pets are driving the growth of this market. Furthermore, the growth in the flea and tick product market in Europe region is due to the development of new products to satisfy the changing consumer preferences and increasing advancements in technology that are boosting the growth in this region. In addition, Asia Pacific region is driven by factors such as growing consciousness of pet health and acceptance of pet healthcare products. The report on global flea and tick product market covers segments such as product, pet type, and distribution. On the basis of product, the global flea and tick product market is categorized into a spot on, an oral pill, shampoo, and powder. On the basis of pet type, the global flea and tick product market is categorized into dog and cat. On the basis of distribution, the global flea and tick product market is categorized into pet superstore, online channel, hypermarket, and supermarket. The report provides profiles of the companies in the global flea and tick product market such as, Merck Animal Health (Merck & Co., Inc.), Ceva Sante Animale S.A., Eli Lilly and Company, Sergeant’s Pet Care Products, Inc., Virbac Corporation, Zoetis Services LLC, Bayer AG, Ecto Development Corporation, Merial Animal Health Ltd and Hartz Mountain Corporation. The report provides deep insights into demand forecasts, market trends, and micro and macro indicators. In addition, this report provides insights on the factors that are driving and restraining the global flea and tick product market. Moreover, IGR-Growth Matrix analysis given in the report brings an insight into the investment areas that existing or new market players can consider. The report provides insights into the market using analytical tools such as Porter's five forces analysis and DRO analysis of flea and tick product market. Moreover, the study highlights current market trends and provides forecast from 2018-2024. We also have highlighted future trends in the flea and tick product market that will impact the demand during the forecast period. Moreover, the competitive analysis given in each regional market brings an insight into the market share of the leading players. This report will help manufacturers, suppliers, and distributors of the flea and tick product market to understand the present and future trends in this market and formulate their strategies accordingly.